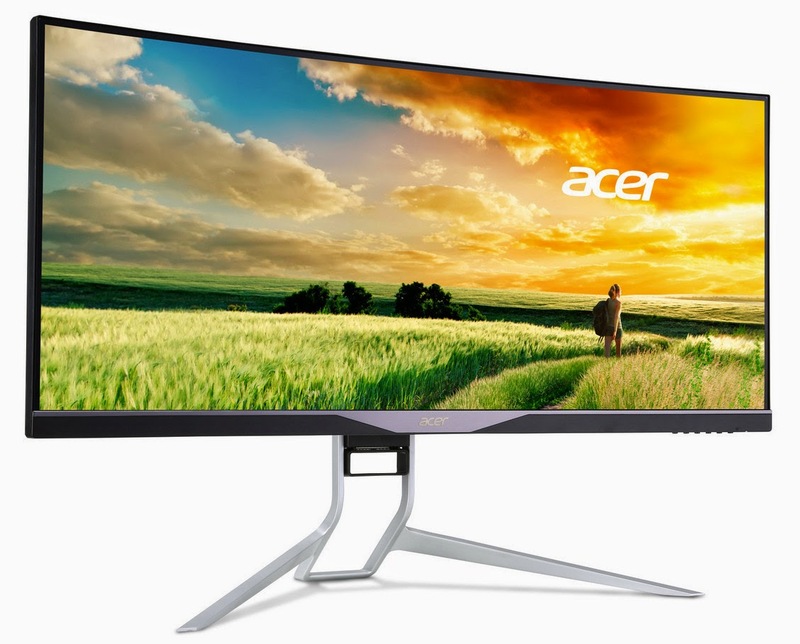 Acer today announced the 34-inch curved 21:9 ultra-wide Acer XR341CKA monitor, the world's first curved monitor with NVIDIA G-SYNC, providing an immersive gaming experience with minimal stutters and screen tears. DTS sound, 2x7W speakers, a zero-frame design with a futuristic aluminum base and ambient lighting options create an exciting entertainment experience with style. 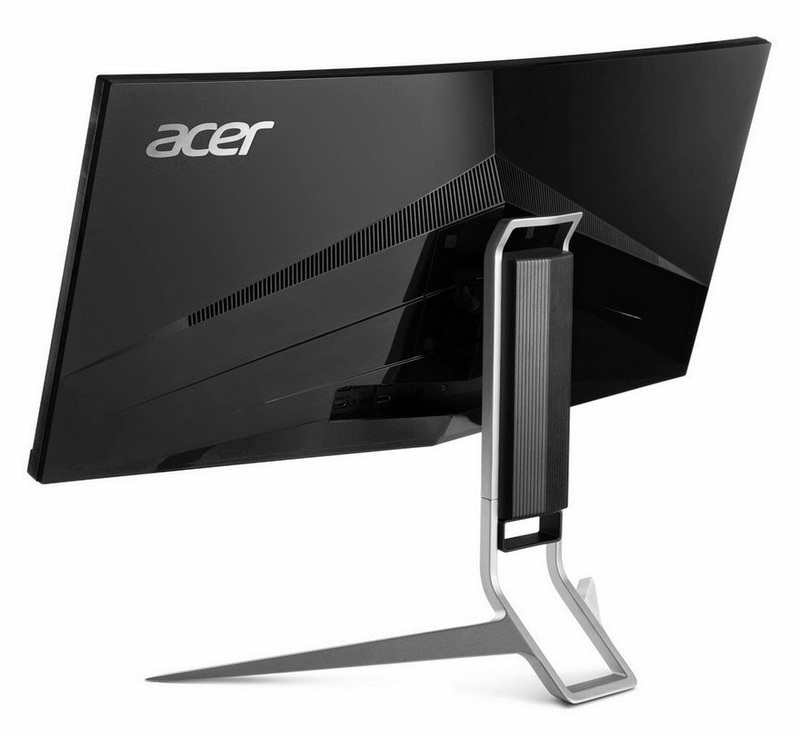 The Acer XR341CKA features a curved 21:9 UltraWide QHD (3440 x 1440) resolution IPS display panel with a 178-degree viewing angle, providing an immersive experience in games and entertainment with a broader view. It supports 100% of the sRGB color gamut, delivering accurate color reproduction desired by design professionals and photo enthusiasts for precise color matching across applications and print output. The curved screen puts every corner of the screen at the same distance from the customer's eyes, providing a uniform viewing experience. It also presents a more immersive experience with a wider field of view and increased perceived area of peripheral vision compared to a flat display of the same size. The XR341CKA can be configured in a multi-monitor setup for an even richer gaming experience, thanks to its zero-frame design. "Acer continues to showcase its commitment to PC gaming with the introduction of their new NVIDIA G-SYNC-enabled XR341CKA gaming monitor," said Jeff Fisher, senior vice-president of the GeForce business unit at NVIDIA. "The preferred choice of PC gamers everywhere is a GeForce GTX GPU, which when paired with NVIDIA G-SYNC technology is the only platform to deliver an ultra-smooth gaming experience across the entire spectrum of PC games." For gamers, the XR341CKA supports multiple features that allow them to fine tune the monitor's performance, including 6-axis color adjustment enabled by NVIDIA G-SYNC, on-screen display of refresh rate, and three different aim-point icons to choose from. Users can easily identify when G-SYNC mode is on through a red ambient light at the lower edge of the monitor, of which intensity changes according to the instantaneous monitor refresh rate. Designed with ergonomics in mind, the XR341CKA can be tilted from -5° to 35° and adjusted vertically up to 130 mm, allowing the user to adjust the monitor to the most comfortable viewing angle. It also features flicker-less technology to lessen eye fatigue for a more comfortable gaming or working experience. The XR341CKA supports DisplayPort and HDMI inputs, and has a built-in USB 3.0 hub which supports high-speed charging of smartphones and other devices. The Acer XR341CKA monitor will be available in North America in September with prices starting at US$1,299, in EMEA in August with prices starting at €1,399, and in China in September with prices starting at ¥8,999.